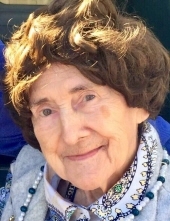 Irene Wanda Bogdan nee Kowalewski, age 96, Long time Gage Park resident, passed on November 7, 2018. She worked as a writer for a local paper and executive secretary for various manufacturing companies. She was also a judge for the Chicago Public School Science Fairs for the past 25 years and volunteered for various church organizations. Beloved husband of the late Raymond; loving mother of Richard and the late Suzanne Arne; dear brother of the late Walter Kent; fond aunt of Alan Kent. Visitation Sunday. Nov 11th; 2pm to 5pm at Zimmerman Funeral Home, 7319 Madison St; Forest Park, IL 60130. Interment to be held privately. Info 708-366-2200 or www.ZimmermanHarnett.com. To send flowers or a remembrance gift to the family of Irene W. Bogdan, please visit our Tribute Store. "Email Address" would like to share the life celebration of Irene W. Bogdan. Click on the "link" to go to share a favorite memory or leave a condolence message for the family.